Interior design for a bar & coffee shop. A local city council initiative supported the redevelopment of ground floor retail spaces in the historic city centre of Palermo in order to bring the ancient streets back to life. 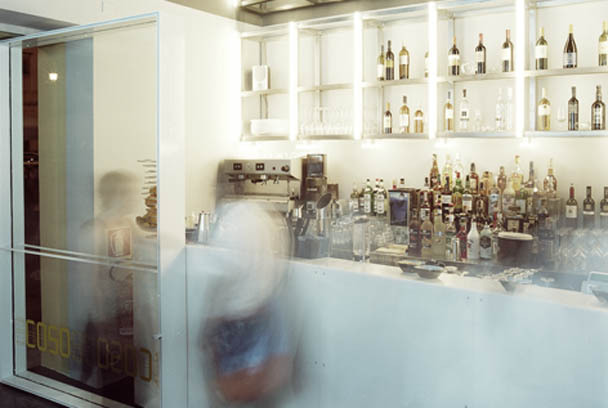 The client acquired a space in a 19th century building, comprised of three rooms connected by small apertures, to convert it into a café / bar lounge. One of the key requirements was to provide different seating arrangements for customers so that they could comfortably sit in small or large groups or even as a couple. The first room works as the main entrance and bar. A movable bench provides flexible seating opportunities. In the second room, sturdy metal beams coming perpendicularly out of the wall act as seats and small tables. A silver-grey curtain separates this space from a series of storage cabinets. In the third and final room, a metal frame covered by plywood panels resembles a giant staircase and provides an informal and practical seating solution for larger groups. The bathrooms, with their sound absorbing foam panels and teflon space dividers have an industrial feel.